One of the long neglected tasks that "will get done someday" has been digitizing boxes of color slides and packages of black and white negatives from wayback. Well, it still isn't done although it did get a prod in the right direction the other day when we were visiting Martine. Somehow or another, she had ended up with a box of color slides from the period around our arrival in America. At that time, a series of poor decisions on the part of my sponsoring employer left us in the unenviable position of illegal immigrants for a while. 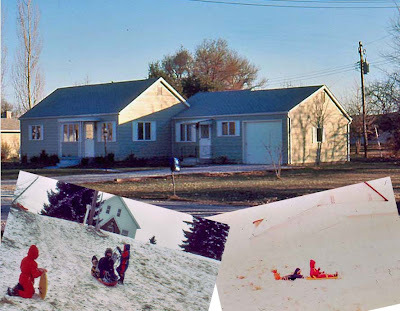 During this period we "hid out" in a tiny ranch house on Winters Road for six months or so, while everything was straightened out with the INS. Here is a picture of our hideout. Looks like Rod has been celebrating. Having steadily followed the improving temperatures north, we arrived home in Indiana on Monday, March 12. Over the preceding weeks there had been quite an accumulation of snow in the area but practically all evidence of this was gone - except for our driveway entrance. Before the thaw, snow must have been piled many feet deep with the successive road plowings and we got our exercise for the day with shovels and sledgehammer to break up the ice and clear the decks. Apart from that, everything went to script and the weather remained gorgeous - 70+ degrees - until Thursday when old man winter stopped by for a few days. But, one probably needs that once in a while to properly appreciate wintering in the warmth. PS - this morning it is bright, sunny, crisp and 24 degrees! Is the Bluebird Over? The Bluebird Wanderlodge, shown here, is built in Fort Valley, GA. Not knowing much about these machines, we stopped by and checked them out. 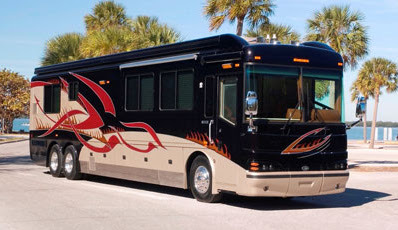 Although owned by the same private equity company that owns the school bus manufacturer across the street and that also owns National Car Rental and is currently looking to buy Chrysler, one has to wonder whether at least the Wanderlodge is about to go toes up. Knowing that more than 13% of their entire 2006 production run is gathering dust in the parking lot is scary enough, but knowing that they only produced 15 coaches last year is positively frightening. In a good year, they produce as many as thirty vehicles but last year "the guys across the street were having money problems" and 15 was all that came out, according to the salesperson. Hmm. As it was, the floor plans (neither of them) were to our liking while the cabinetry and decor are best seen to be believed. We took the Kinko quality flyers and left. Andersonville, GA, was the site chosen by the Confederate authorities in 1863 for Camp Sumter, a prisoner of war camp begun in 1864. A little over a year later, when the Civil War ended, 13,000 Union prisoners had died in the facility. Practically every other prison camp, on both sides, had appalling records regarding inmate deaths but none compared to Camp Sumter. 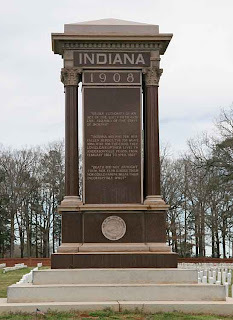 As the memory of the war faded and more rational heads prevailed, the efforts of a few finally culminated in Congressional legislation, more than 100 years later, to develop an historic site embracing POW issues from all conflicts, including of course, the Civil War. This mandate has seemingly been met. The cemetery was also opened to all qualified military personnel and now contains more than 18,000 graves and markers. Just a quiet 20 minutes off of I75, a couple of hours could be spent in many poorer ways. Last night, from just after 5:00pm until about midnight, Perry, Georgia, where we are camped, was on and off under Tornado Warnings. The campsite has no contingency plans for such circumstances and possibly the right thing to have done would have been to drive to Wal-Mart and lurk around the northeast corner of the store for six or seven hours. At least, in the Wal-Mart here, that is the automotive and RV supply area - it could have been fabric sales! The storms were traveling northeast at 55 to 60mph making the timing of the 20 minute journey quite precarious so instead, we decided to remain in the coach checking local TV stations, Internet sources and the local NOAA broadcast. Outside of a few coach jarring wind gusts and a lot of torrential rain we lucked out although folk in close by areas did not all fare as well with six deaths and significant property being reported this morning.